One of the great things about waiting 5 years to have our children has a great bonus of making us appreciate them and enjoy them more. One of the awful things about waiting 5 years to have our children is that it gave us many childless years to become set in our ways. One of my ways is, I like things in order. When I cook, I clean as I go. I wasn't always that way, my mom will be quick to tell you. But, my many childless years changed me. My grandmother didn't teach my mom to cook. I don't think my grandmother cooked. She mostly ate out, or microwaved tv dinners. Actually, she mostly ate pie and donuts, I think. So, my mom really wasn't able to teach me to cook. My other grandmother taught me a few things. Sadly, her time with us was cut short, long before I was able to learn all she had to teach me. Good thing I make a living working in restaurants. Good thing I went to college to learn to cook. Good thing there's food network. I want my girls to learn how to cook. I don't mean, make a salad and grill a steak. I mean, I want them to learn what's behind cooking, the why of cooking. I want them to be able to understand cooking from scratch. Not only is it healthier and usually cheaper, but it's fun! And way yummier. So, today, Camdyn and I made bread together. It's a new recipe for me, so I hope it turns out good. She learned the term "knead". She practiced kneading. And, she loved it. 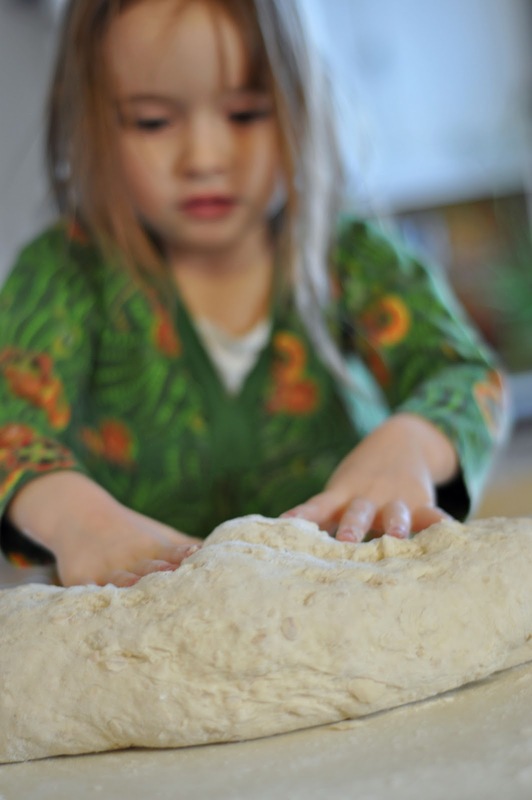 She hung out with me from the moment we started mixing until the moment we set the bread aside to raise. I think as we are working, it takes patience to teach her this. It's not as fun as it looks. It would be way easier for me to do it myself. I'm sure stepping outside my comfort zone. But, isn't that what God does with us every day? His life would be much easier if he just did everything himself, making good things for us to enjoy. But, he teaches us, patiently, to "cook", hoping that, when we're older, we will remember the basics of life and use them to nourish others. I'm thankful for his patient teaching with me. Such sweet memories you will have of cooking with your daughters! Bella and I cook together all the time, and I just love it! 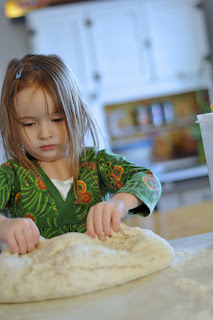 She looks like she is having a blast:-) I find the same struggle when I am baking with the kids...it would be so much easier to just step in and do it for them...but then they wouldn't learn how to do things. And I love your analogy to how God teaches us to "cook", so very true. Just checked out your Etsy, your hats are PRESHHHHH!